Peer-reviewed Article Reports ProImmune's Immune Formulation 200® Activates the Immune-Support Gene Nrf2. 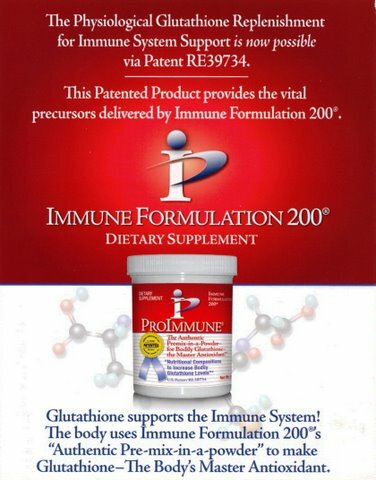 The ProImmune Company's Immune Formulation 200® Dietary Supplement, a novel Glutathione precursor which replenishes bodily Glutathione, also activates Nrf2. Nrf2 mobilizes approximately 250 immune support genes, a major asset to immune system support, The Glutathione synthesis pathway is also a route to Nrf2 activation. The study was reported in peer-reviewed Experimental and Molecular Pathology. ProImmune's Immune Formulation 200® is able to potentiate Glutathione synthesis via the Pleiotropic Paradox, which utilizes the pleiotropic delivery system of the disulfide bond--L-Cystine--to carry L-Cysteine safely to cells,. Upon contact with epithelial cells, the L-Cystine is decoupled by the substrate specific enzyme thioltransferase, allowing L-Cysteine safely into cells to enter into the Glutathione Synthesis chain. Dr. Albert Crum, a Harvard-trained scientist and CEO of The ProImmune Company, LLC, Rhinebeck (NY) is the inventor of Patent RE42,645E/RE39,734 and its Immune Formulation 200®. University research using Immune Formulation 200® provided by The ProImmune Company, LLC, has demonstrated that this novel Glutathione precursor’s immune support effects are unexpectedly wide-ranging. The coupling of a thiol-disulfide compound is another safe physiological carrier system for L-Cysteine, because it holds the high oxidizability of L-Cysteine in abeyance ("on hold") until it is delivered to the intracellular milieu. Metaphorically speaking, the Glutathione pathway of Immune Formulation 200® activates the immune system like a city power grid station which ignites or electrifies a city's lights. The Dietary Supplement Immune Formulation 200® is a strong support for the immune system in multiple ways. Immune Formulation 200® works physiologically, both to raise bodily Glutathione levels and to activate Nrf2, while offering an inherently natural sweet taste without carbohydrates. Immune Formulation 200® (“F1”), a dietary supplement, is the patented precursor for the intracellular synthesis of Glutathione. Specifically, research on Immune Formulation 200® provided by The ProImmune Company, L.L.C., has been conducted over several years by a team at Drew University of Medicine & Science, Los Angeles (CA). Other universities such as UCLA, University of California (Irvine), Los Angeles Biomedical Research Institute (Torrance CA), and University of Texas Southwestern (Dallas) are included among those conducting the basic research on Immune Formulation 200®. Research results began being published in 2008. Research studies of Immune Formulation 200® have pointed to the interrelationship between Glutathione repletion and activation of gene Nrf2. Immune Formulation 200® is winning international consumer favor--for the value of its diversified immunological support and for its naturally sweet taste. The study which associated Immune Formulation 200® with the activation of Nrf2 was supported by NIH-NCCR Accelerating Excellence in Translation Science Grant (U54 RR026138) and NIH-NIMHDP20MD00182.